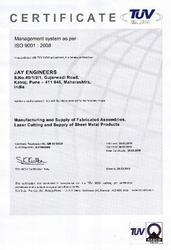 We, Jay Engineers established in 1986, are a reputed organization engaged in manufacturing, exporting and service providing a wide range of Industrial Enclosures, Cabinet Workbench, Steel Laser Cutting Service, Turret Punching Services and much more. Acknowledged for their durability and reliability, the products are extensively demanded by steel manufacturing units and packaging industry. Our well-developed infrastructure, equipped with the latest technology and testing amenities helps in catering to the needs of the clients. The facility is taken care of by our expert technicians. These experts incorporate various production techniques for manufacturing our range. Additionally, our modernized research & development wing helps in enhancing the quality of the products in accordance with the latest industry trends. Our organization is headed by our mentor, Mr. Pratap Mane, who has rich business intellect and possesses sound knowledge of this domain. With his able supervision and constant guidance, we have retained the trust of our esteemed clients. Area of Plot: Our present area of plot is 15000 Sq. ft.
Power : At present we have a sanctioned load of 100 H P from M.S.E.B. Alternative Power: Generator to deal with power cut / load shading we have setup our own power generator set of capacity 25 Kva. of Powerboat make with canopy. Water / Sanitation. The quality, performance and functional competence of our Enclosures have helped us in getting an edge over our competitors. Our organization holds expertise in designing both standard and customized products.